For those of you in the Buffalo Film and Arts community, the name DefTone Pictures Studios may be a familiar one. DefTone Pictures Studios is a local Buffalo based film production company that’s been producing independent film in the horror/comedy genre for the past 10 years. Steigert’s Sci Fi film Not Human was distributed worldwide in VOD and DVD over the past two years, and his latest title A Grim Becoming has earned 13 nominations and 5 awards touring the film festival circuit nationwide this past year. 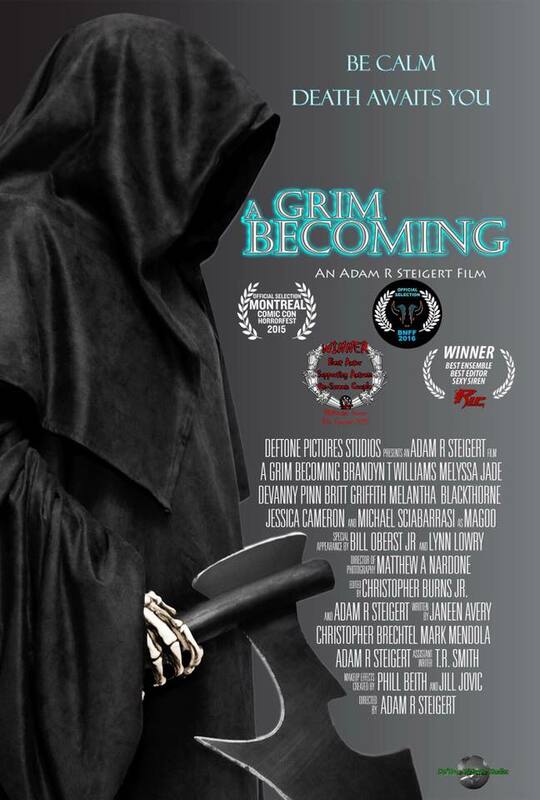 If you haven’t yet seen the award winning horror comedy A Grim Becoming, you can catch a local showing at the Buffalo Niagara Film Festival, Saturday, April 16th at 12:00pm at the Castle, 69 Delaware Street in Tonawanda. A Grim Becoming features scream queens Melantha Blackthorne, Lynn Lowry and Devanny Pinn along with Bill Oberst Jr. in what Steigart describes as “an off the wall horror comedy about the trials and tribulations one faces while being appointed the job of being a Grim Reaper.” Raphael, a young executive, experiences a life changing event: witnessing a Grim Reaper taking a soul. This sighting results in Raphael becoming a Reaper himself and having to explore his own conscience and the lengths he will go to get his own life back. But Death, has other plans for the naive young executive. DefTone’s next production, the SciFi Comedy S.T.A.R. is in post production, and slated for a summer 2016 release. For more information, visit www.deftonepicturesstudios.com. Or find the film company on facebook!